Today we started mappin’, world mapping that is. 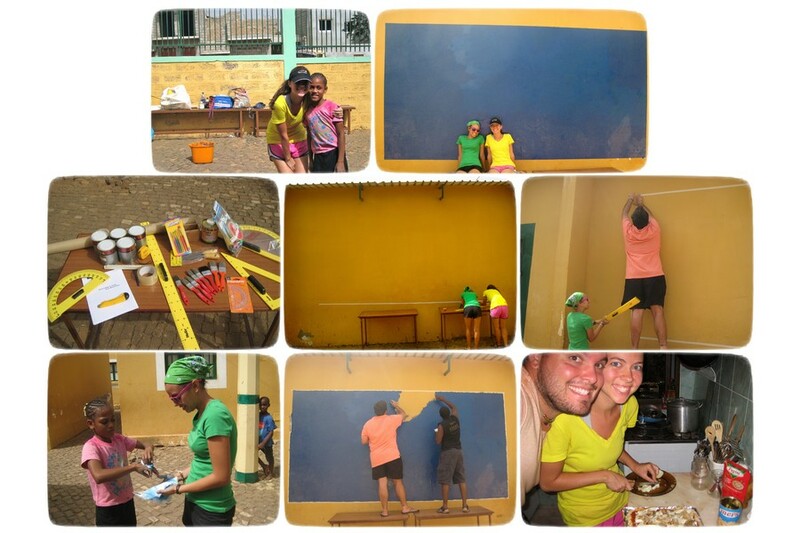 Since day one of teaching at São Filipe’s elementary school, a fellow PC Volunteer (Jon Berg) and I have discussed, debated and envisioned a world map mural on the outside of our classroom. And today, with paintbrushes, meter sticks, pencils and chalk in hand, our vision came true, line-by-line and stroke-by-stroke. We started the morning off with three PC volunteers looking at a vast, blank wall questioning our abilities, and ended with a vibrant, blue, nearly perfect rectangle and three additional helpers at our side, including a student and the school groundskeeper. As we walked home, with blue hands and tired feet, we couldn’t stop talking about the next day of painting. However, painting will have to wait because tomorrow is election day. After a short ice cream break and an unscheduled nap it was time to tackle the NEXT big project of the day… what to make for dinner. After some serious brainstorming we decided on pizza with a chocolate banana coconut cookie pudding for desert. What began as a normal attempt at trying to make something edible turned into what could quite possibly be the most DELICIOUS pizza that Jon and I have made together — in my kitchen, with no cooking utensils and limited ingredients, all after beginning our world map project, that is. Step 1: Buy pizza dough at the local bakery. Step 2: Wander through the grocery store searching for toppings and then deciding on the perfect combination. Step 3: Add 4 caring hands and mix assorted ingredients creatively. Step 4: Take a series of photos with our homemade pizza (see below). Jon B. and Krista P.
Look at you little cooker-bug! Krista, you just made this geography teacher very happy. Good luck with the map mural. We saw a few of them at schools in Belize this year.